Description: The Dutch resistance, during the Nazi occupation, was unfortunately plagued by betrayal and a lack of organization and support. Despite these serious problems, it made a significant contribution to the Allied war effort, though at a terrible price. This contribution, including the organization of escape routes for allied aircraft crews and sabotage deeds, is largely overlooked outside the Netherlands. The main character in this book, Henry Scharrer, is the father of the writer's wife. He is a Frenchman born in Belgium. Although he had lived in the Netherlands for a long time and even married a Dutch woman, he never became a Dutch citizen. In the Netherlands he was the leader of a resistance group during the Second World War and arranged forgeries of documents. Because of his language skills, he served as a translator for the writing press. In the end, he becomes a reporter himself. He builds up a huge network and gradually becomes more and more involved in the intelligence service of the Free French in London and the British secret service, whether or not via side branches of the Dutch Secret Service. Scharrer is good at arranging forgeries of documents and is co-organizer of a smooth-running escape route to the South of France. The people they consider eligible, would travel through Roosendaal or Maastricht to Lille and from there via Paris further south. Allied pilots and agents of the Dutch government who return after a mission was carried out: everyone who wants or have to leave, has to get a chance. Scharrer made many contacts within the underground forces and fertile companionship arises for the resistance. On August 18, 1944, Scharrer is arrested on the train from Haarlem to The Hague because his papers are (seemingly) wrong. After being interrogated at the Oranjehotel in Scheveningen, he ends up in the Amsterdam detention center. Heavy interrogations take place there, including by the notorious SD man Herbert Oelschlägel. The Sicherheitsdienst decides to use a cell spy to find out who works with Scharrer. That spy, Pons, gets the necessary information out of Scharrer. The Germans then set a trap for Scharrer's resistance friends by pretending that he could be redeemed with ransom. On August 29, 1944 a group of comrades hands over the money in a café on the Amstellaan. Everyone is arrested, including his good friend, Fritz Conijn, leader of the resistance in Alkmaar who has the ransom in his pocket. The men are taken to Camp Vught. In mid-August 1944, the Allies made a breakthrough in Normandy and advance in the direction of Belgium and the Netherlands. They liberate Brussels on 3 September and Antwerp on 4 September. In a panic, the Germans set up an evacuation plan for Camp Vught, partly by the execution of an order from Adolf Hitler that "terrorists" must be executed without any form of trial. On the basis of this so-called 'Niedermachungsbefehl', 450 resistance fighters are executed just before and during the evacuation at the execution site near the camp. These executions are called the 'Deppner executions'. Erich Deppner is the SS officer and SD officer who ordered these executions. Deppner has never been punished for these executions. Scharrer and Conijn are shot together with a number of other members of the resistance in the early morning of Wednesday after 'Dolle Dinsdag' (Mad Tuesday) on 6 September 1944. The writer has researched and explored numerous stories and as a result, you get a good insight into the very difficult and heroic resistance work. Stories about co-resistance fighters or rescued Allied pilots are described in the book. The working method of the Germans and Dutch collaborators, including the well-known Christiaan Lindemans, also known as "King Kong", are discussed. The book starts with a preface and prologue, has nineteen chapters in four parts and concludes with an epilogue. The four parts are successively: stories of hope and heroes, stories of the enemy and traitors, stories about pilots and betrayal and finally: stories about victory and survival. A documentation list and alphabetical index complete the whole. "The Dutch Resistance Revealed" is a very nice book that gives a lot of insight into the resistance, the pilots support and how betrayal and collaboration with the Germans had to break the resistance. Scharrer and Conijn are relatively unknown leaders within the Dutch resistance, who are introduced to an English-speaking audience with this book. As a result of the pilots smuggling, Scharrer has received posthumous thanks from the American commander-in-chief Dwight Eisenhower and British vice-commander Arthur Tedder. Conijn has been posthumously awarded the rare Dutch Resistance Cross. Recently the book The Dutch Reistance Revealed was published by the Britisch publisher Pen & Sword. 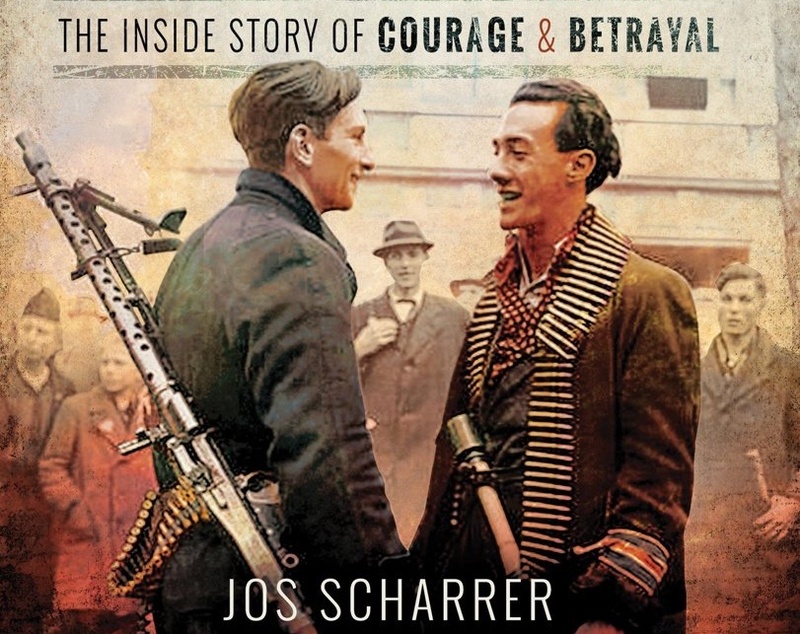 TracesOfWar-contributor Wijand de Gelder reviewed the book and asked the writer, Jos Scharrer, some questions by e-mail.